Uptown! Entertainment Alliance presents “A Night of 1950’s & 1960’s DOO WOP” featuring “the Voice of New Jersey Doo Wop,” Joel Katz with his group, the Dynamics backed by a live band plus the smooth street corner acappella sounds of Frankie & the Fashions. One night only – Saturday November 4, 2017. It takes place at the Uptown! Knauer Performing Arts Center, 226 North High Street, West CHester, PA 19380. The concert will be emceed by Classic Urban Harmony’s Pam & Charlie Horner. Tickets are $35 and $25 and are on sale now at www.uptownwestchester.org. 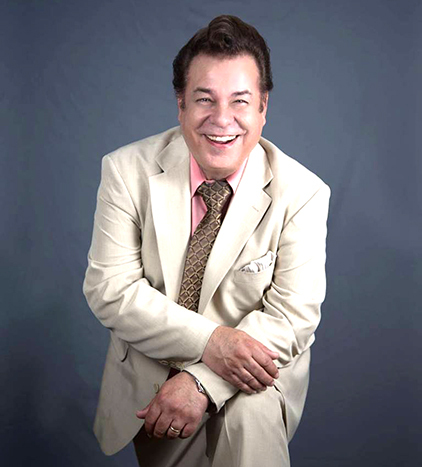 Joel Katz is the voice of New Jersey Doo Wop music. For the past five decades he has been a major force in keeping 50’s and 60’s music alive. His tenor voice has fronted many groups including Joel & the Conchords,the Autumns, the Wizards, the Platinums, the Connotations, Twilight, the Dymensions the Cliftonaires and the Dynamics. Over the years, Joel has also sung with name groups, Brooklyn Bridge, the Five Discs, the Emotions and The Impalas. He was a background vocalist on the Aaron Neville Album, “My True Story”. Backed by a live band, Joel Katz and the Dynamics will wow you with the harmonies of street corner classics of the 50’s and 60’s. 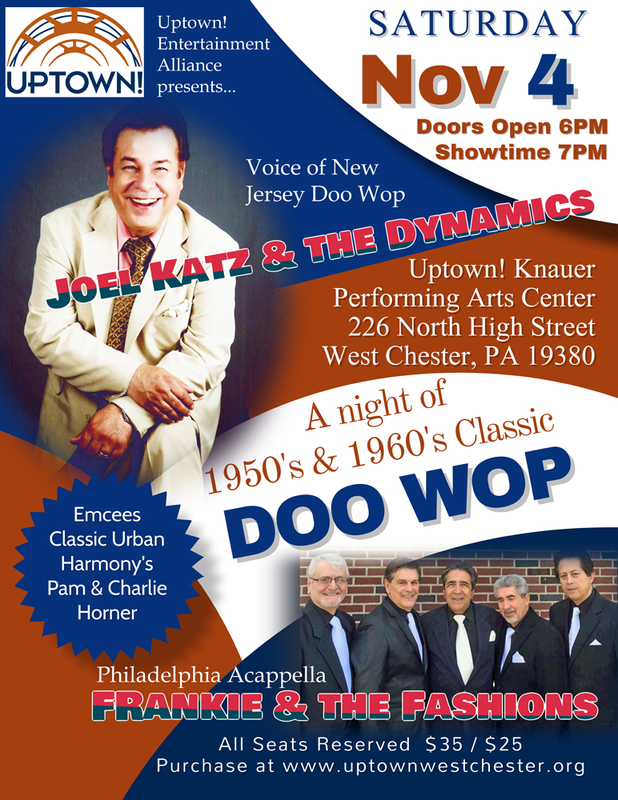 Opening for Joel Katz will be the superb doo wop acappella group from Philadelphia, Frankie & the Fashions. 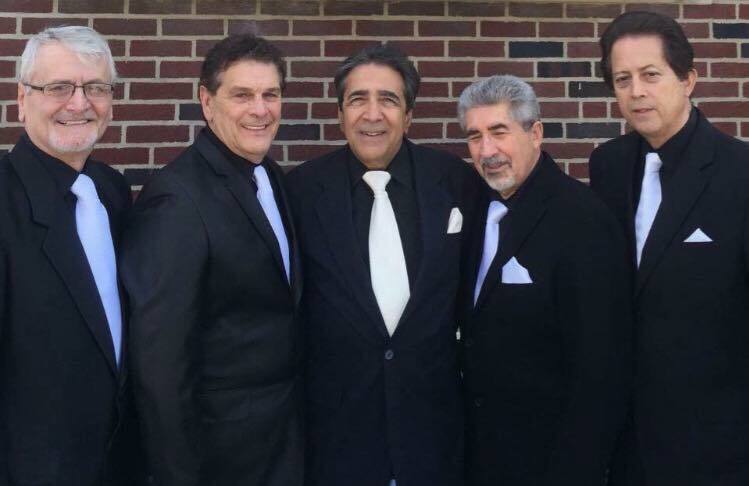 While the current configuration of Frankie & the Fashions has been together for eight years, the origins of this great vocal group go back to the early 1960’s. Group founder and lead, Frank Lafaro, is also a talented songwriter, having written close to a hundred songs including the group’s signature song, “What Do I Have To Do”. Frankie & the Fashions’ flawless acappella harmony . The Uptown! Knauer Performing Arts Center is located in downtown West Chester, PA. Two years ago, the non-profit Uptown! Entertainment Alliance launched and $4.2 million fund drive to purchase, preserve and renovate the West Chester Armory as a theater for film and live performance. The result was a multi-performance space venue featuring a magnificent 327 seat main stage theatre that opened on December 31, 2016. In recent years, the center of West Chester has undergone a great revitalization. There are now a wide variety of boutiques and shops and over 80 dining opportunities that serve local residents and draw tourists and people from the surrounding area into the historic downtown. In June of 2018, the Uptown! Knauer Performing Arts Center will be the first theater on the East Coast to host the music, “Soul Harmony” about Deborah Chessler. Sonny Til & the Orioles, starring De’Sean Dooley, grandson of the late Orioles’ lead, Sonny Til. Classic Urban Harmony is also working with the Uptown! Entertainment Alliance to host a number of multi-group doo wop and rhythm & blues acappella concerts there. Our first will be on June 23, 2018, and will feature De’Sean Dooley backed by Quiet Storm singing Orioles’ songs acappella. Other groups will be named at a later date.